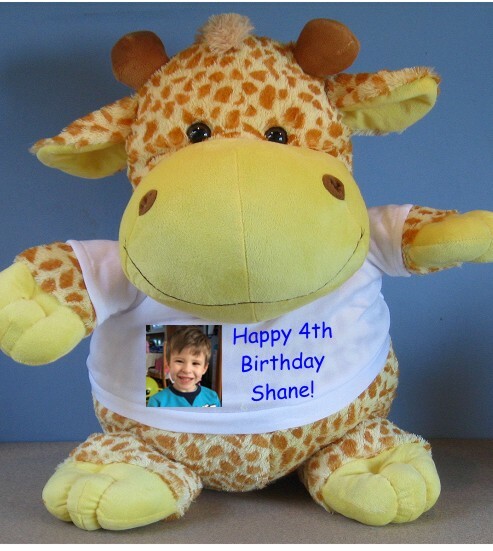 Personalised Full Colour Giant Giraffe Teddy with T-shirt. This gorgeous giraffe has a customisable t-shirt ready for you to add text and/or a picture. It measures an amazing 50cm from head to foot!! A cuddly half a metre tall! See the other giant cuddly toys in this range including a Duck, Tiger and Puppy. Ideal as gifts for Page Boys, Flower Girls, Christenings, Birthdays, Valentines Day, Easter, Christmas….it’s endless! Please note these are only suitable for children aged 3 and over. Please see below for the fonts that we offer and click the customise option to inform us of your requirements.